Chamber Ensembles are small groups of like instruments that perform music arranged just for their instruments. Ensembles at Cherokee are formed in the winter based on student interest and can include such groups as Flute Ensemble, Clarinet Ensemble, Saxophone Ensemble, Trumpet Ensemble, Brass Choir, and Percussion Ensemble. 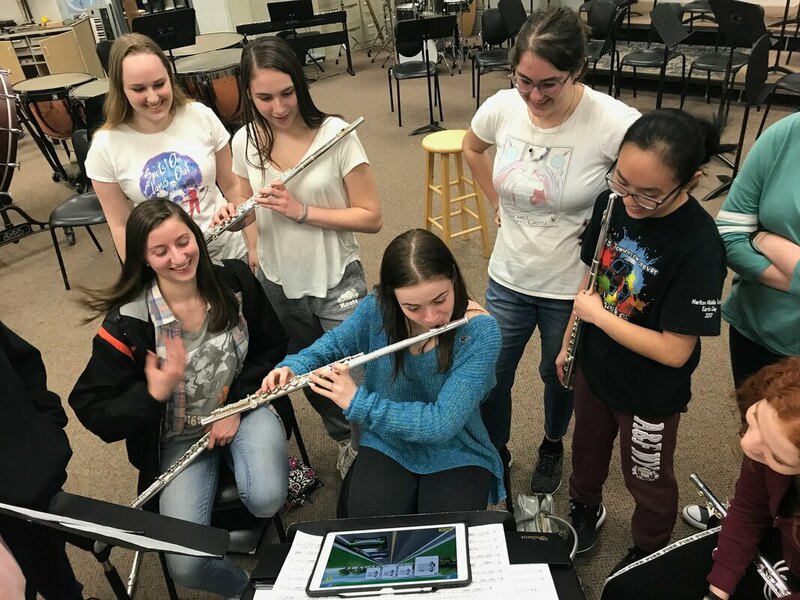 The Cherokee 2019 Flute Ensemble, pictured here, watches Ensemble member Emily Paluba play a game called Flute Racer on an iPad. ​Flute Racer ​listens to you play your instrument as you quickly switch between notes to keep your car fueled as you pass other cars.